The granddaddy of commercial treadmill desks, Steelcase's now 7-year old design is becoming antiquated compared to what can be purchased from top-rated walking treadmill and adjustable-height desk manufacturers. Steelcase pricing has fluctuated over the past year in response to ankle biting from competitor LifeSpan, but has remained extremely high for such outdated technology. Much better values can be had by combining iMovR or LifeSpan treadmill bases with any number of gorgeous and functional adjustable-height desks in order to achieve the perfect workstation for your needs, for at least $1000 less. At the time they were the only game in town Steelcase helped to spark a revolution in office fitness. Overpriced, antiquated technology with very poor mechanical attributes and ergonomics. With all the new competitors on the market featuring technology that's up to eight years newer, at half the price or better, its time for this pioneering product to move to a museum exhibition. Steelcase helped Dr. James Levine spark a revolution in office fitness, but that was in 2007. Since then so many competitors have introduced such better technology and half the price that the WalkStation is now more of a relic of the past than a harbinger of the future. Steelcase representatives have openly admitted that the company has no plans to ever enhance this product or focus on marketing it, though they'll keep taking orders for it as long as corporate buyers want to buy it. The Steelcase Walkstation is the granddaddy of commercially-produced treadmill desks, originally designed at the behest of Dr. James Levine of the Mayo Clinic, the “father of the treadmill desk” and our visionary savior from the ravages of sitting disease. With Steelcase’s massive distribution capability it has become the most common treadmill desk that major employers like Intel and Google buy for their employees. Because of its high price tag, it is not one you’ll often find in home offices or small businesses that are more budget conscious. At one time priced at over $5,000, Steelcase has repeatedly dropped their prices over the past year - now down to $4,599 for the basic model - in response to competition from LifeSpan, iMovR, and the many other units you see reviewed here at WorkWhileWalking. The basic model hasn't been updated since its introduction in 2007 so when comparing to new technology like the ThermoTread GT the Steelcase Walkstation has aged poorly, and no amount of discounting is going to make up for the technology gap. Would you pay top dollar for a 2007-era personal computer even if the vendor hacked ten percent off the price tag? Probably not. A lackluster showing at the 2013 Ergo Expo convention demonstrated just how out of step Steelcase has become. The Walkstation is the same machine it always has been. Exposed screws and less-than-elegant lines make the treadmill look like a prototype, rather than a finished product. Even the desk is lacking the luxury normally seen in Steelcase furniture. Steelcase representatives confirmed that the product has essentially been orphaned within their product organization, and there are no plans to ever update it. However, if orders come in - admittedly, an increasingly infrequent occurrence - they'll continue to ship the product. The Walkstation is a fully-integrated electric height-adjustable desktop with a treadmill that has been artificially governed not to exceed a top speed of 2.0 mph. Steelcase claims that the treadmill is designed specifically for walking (meaning its motor has more torque at low speeds than conventional running treadmills do, so it won't quickly burn out) but they don't publish any relevant specs to inform the buyer about what is really under the hood. Maybe as furniture manufacturers, Steelcase's marketing checklist lacked such essential items as horsepower ratings, but it is a mandatory spec for any treadmill desk manufacturer so we're somewhat troubled that it is undisclosed. Another telltale sign of the aging design of the Walkstation is its horrendous power consumption, which at a specified "3A to 8A" range is far more than LifeSpan's TR5000, and dramatically more than the most modern office treadmill, the iMovR ThermoTread. In terms of noise consumption we have been unable to lab test the Walkstation - since Steelcase has repeatedly declined the opportunity to provide a test unit to our labs - but based on multiple trial uses we've had on the unit at trade shows we can say it's, again, significantly louder than the Lifespan treadmills, and dramatically louder than the virtually-silent iMovR treadmill. The maximum weight rating is stated as 350 pounds, but of course this has never been certified by any outside testing lab; manufacturers of treadmills publish whatever weight limit rating they feel like (see our article on treadmill weight ratings). Based on all the calls we've received over the years from Steelcase customers whose Walkstation treadmills (we believe made in China by True Fitness) have burned out, we're very skeptical of this rating. Stepping up to the treadmill deck will require a 6” leap off the ground. The belt is a little narrow at 18” wide but plenty long at 53”. It's comparable in terms of belt size is the bottom-of-the-line LifeSpan TR800 unit, and is a couple of inches shy of the preferred belt width for working at a treadmill desk. The Walkstation’s display console is mounted underneath at the front edge of the desktop. The display indicates speed, calories burned, time and distance. A very nice feature of the control console is that it can be slid back under the desk so the distance between the user and their keyboard is not increased. Other desk manufacturers that have emulated Steelcase’s control console location but fixed it in place have committed an ergonomic no-no (namely the LifeSpan and Exerpeutic units). Still, the bumper guard itself is the first of at least two major ergonomic no-nos in this treadmill desk's design, as it exacerbates "computer hunch" by pushing the keyboard even further away from the user. The other major issue being that the control console placement makes it impossible to ever install an ergonomic keyboard tray. Steelcase offers two desktop options for the standard Walkstation, a 38” rectangular top or a 66” wing-shaped top. Both have a center depth of 32”. Showing their furniture manufacturing DNA, Steelcase offers several options for frame, desktop laminate, edge and trim paints and finishes. The desk is rated for 180 lbs. of surface loading. Not a lot by today's standards, but probably strong enough provided that you avoid back-loading the desk with too much equipment (underpowered lifting legs can burn out from too much "side loading"). The desk frame is physically separated from the treadmill frame so that oscillations from walking are not introduced into the desk. For $425 more you can purchase the Sit-to-Walkstation version with an extra-wide desktop that will allow you to keep a chair to the side of your treadmill base. Lower the desk to a sitting height, slide the monitor and keyboard in front of you and you’ve changed modes in less than 15 seconds. In theory, a great idea, but the Sit-to-Walkstation may not quite live up to its premise on paper. Even Steelcase's own publicity shots show that their desk isn't quite wide enough to comfortably accommodate a chair and a treadmill side by side. Until the introduction of true sit-stand-walk desks from iMovR - such as the Everest, Olympus, Elite and UpTown models - there really wasn't a good off-the-shelf desk option to pair with a good walking treadmill base to create a sit-to-walk configuration; that was practically the only reason to opt for a Steelcase unit over any other treadmill desk configuration if you disregarded the price/value equation. iMovR desks feature the best designs and stability ratings for use with an office treadmill, and will save you an easy $1,000 over the vintage Walkstation desk. Up and Down buttons on the control console will let you adjust the desk height from 24 1/4" up to 52." At a velocity of 1.25 inches per second it’ll take only about 8 seconds to change from sitting to standing height. The lift mechanism is a 3-stage rail powered by an internal DC motor. Noise levels for the desk's motors are not published but our review team members who've used the product think they're at least three to four times louder than the ultra-quiet iMovR electric desks, on a dB scale. It's worth mentioning iMovR's EcoLast TreadTop Standing Mat as a great add-on for the Steelcase, or any office treadmill, for that matter. When you want to take a pause from walking the last thing you want to do is stand on the cushion-less hard deck of a treadmill for very long, lest your feet start to suffer. These TreadTop mats are premium-quality, 100% polyurethane standing mats that are cut to size to specifically fit popular office treadmill models. They can be used atop the desk or astride the treadmill if you have a sit-stand-walk workstation, or both. Be sure to check out our 5-star review of the TreadTop Anti-Fatigue Mat. For the Steelcase Walkstation, you'll want the 18" x 30" version that'll fit comfortably between the side rails. Like many of their other desk offerings, Steelcase offers add-on accessories such as a SlatRail for $108 (the purpose of which is a little unclear in a treadmill desk application), a Cableway for cleaning up all the loose cables coming off our monitor and desktop for $67, and a fully-articulating monitor stand with a 20 lb. weight limit for $195. You don’t have to use their monitor stand if you prefer a different brand. See our monitor stand reviews for some less expensive alternatives if you don’t mind breaking from the precise Steelcase color palette. Steelcase sells the Walkstation directly from their online store, with a 5 week delivery time for the Walkstation products. We contacted Steelcase distributors all over the US who said they could order us a unit but they had no floor models that we could evaluate. The company has repeatedly turned down the opportunity to have their products tested in our labs. So unless you have a colleague with a Walkstation who will let you try it out you may have to buy it sight unseen. While the WorkWhileWalking retail store in Bellevue, WA, has all the popular models of treadmill desks on display for people to experience first-hand, the Walkstation is absent; as it is from Steelcase's own corporate showroom at the Merchandise Mart in Chicago. 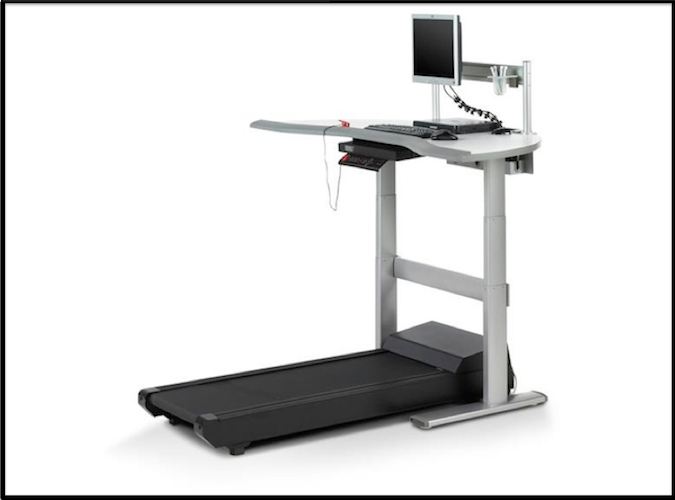 The company has recently stopped exhibiting the treadmill desk at trade shows like ErgoExpo, as well. As we said, it appears to be an "orphaned" product, as we've heard now from several Steelcase representatives who would speak with us candidly off the record. All in, a Sit-to-Walkstation with all the options will run you close to $5,000. At a combined weight of 225 lbs. you’ll be very relieved to know that free shipping is included if you have a loading dock. For inside delivery expect to shell out a few hundred bucks. A lifetime limited warranty on the frame is pretty typical for a treadmill desk manufacturer and Steelcase’s warranty is no exception. Steelcase offers a 3 year warranty on “parts and wear items” and a skimpier 1 year warranty on treadmill service labor. More generously, the lifting column, electronics and urethane profile of the desk carries a 5 year warranty, with 12 years for all the other desk parts. Given the premium pricing and Steelcase’s claim of a very robust treadmill design we were a little surprised to see such a short warranty on the treadmill itself. This does more to confirm our experts' consensus sentiment that the treadmill technology is outdated, energy inefficient, and potentially underpowered for continuous duty operation or for users weighing over 300 lbs. We have one of these at my office that we all share. It’s not bad. But then we got a (dramatically cheaper) LifeSpan desk to supplement it because it was always in such high demand. I use both (based on which one is available at any given time…sometimes neither one is! ), but I absolutely prefer the LifeSpan desk because it allows me to walk a bit faster. The LifeSpan TR1200 treadmill goes up to 4.0 mph. I start to get sweaty as I approach 3.0 mph, so 2.5 mph seems to be my sweet spot. I always feel like the maximum 2.0 mph on the Steelcase Walkstation is too slow. I know you’re not SUPPOSED to exceed 2.0 mph on a treadmill desk, but I have no trouble typing and being productive at 2.5 mph on the LifeSpan desk. I work in technical support, so I even talk on the phone while I’m walking on both desks. I once completed a 10K on the LifeSpan desk during one particularly long call, and the caller was none the wiser when I told her what I had been doing. Both of our treadmill desks at the office get A LOT of use. The Walkstation is starting to show its age now…whenever it starts up, there’s a terrible grunt. Maybe it just needs maintenance. There’s absolutely no reason to pay this kind of money for the Walkstation now. There are better options available at half the cost (or less). And don’t be afraid to go a little faster than 2.0 mph while you work. Thanks, Daniel for posting such a great review – very helpful – do you find the extra length on the Walkstation helpful? FWIW, according to a treadmill tech based in Maine who regularly blogs about repair jobs (and posts pictures), the treadmill itself is sourced from True (which is a very solid treadmill brand; it even has a True sticker on the frame), and the motor has the same Turdan catalog number (B2J051) as the one used in the LifeSpan 1200-DT3. The labeled HP is 1.1 (vs. 2.25 in the LifeSpan), but this makes perfect sense since it has a max speed exactly 1/2 that of the LifeSpan units.